For your BPD daughter, her experiences are her own and her feelings will be driven by thoughts that may well be distorted. It sounds as if the punishment she chooses to give you, among other things, involves not letting you see your grandson. Sad as it may be for you right now, knowing you cannot change or rescue your daughter, and that you want to be able to see and support your grandson, it will be important to validate your daughter’s feelings and to accept that, for now, (until she gets some professional help) your daughter is not going to be able to consider, respect, or care about your feelings as it is only natural to want her to do. Remember that painful though it can be supporting and validating how your daughter feels even when you don’t understand or you know that she has some cognitively distorted reactions unfolding will help you to accomplish your immediate goals. As much as you may want to protect or rescue her and/or your grandson from what might be the consequences of her actions, to your grandson, in her marriage or her own life generally, it is now up to your daughter to seek professional help and take responsibility for her own actions. Unless and until she does this, the best you can do is radically accept that she has BPD and what the reality that means to the ways that she relates to you knowing that when a mother has done her best and not in any way abused her daughter, that is the best you can do. Even mothers need to step back emotionally at times and while being compassionate and supportive detach with love. In seeking to accomplish immediate goals it is not realistic to think that you can create any change in what your daughter thinks, does, or feels. It is also not realistic, right now, to think that you can succeed in having your daughter understand how you feel or where you are coming from. Any feedback you might have sought to give her in the past is likely experienced by her as invalidation, judgment, and rejection and/or abandonment even though you have actually tried to help her and not invalidate, judge, reject, or abandon her. What is very central and key for any loved one of someone with BPD, and for you as the mother of a daughter with BPD, is to first learn how to not react to your daughter and then secondly practice your coping skills in not reacting to your daughter. There are many different ways to learn more about how to cope most effectively and how to not react or have your buttons pushed by your borderline daughter. Along with things others have written on this topic and things I’ve written and done audio programs about on this subject, this is what I help many parents of those with an adult-child of BPD with in my BPD coaching as well. It is not easy to not react. It takes concerted effort and practice to not react. It is important to be mindful of what your goals are however. Once you’ve identified your goals the next step is prioritizing those goals and keeping them central in your thought process when you communicate with your daughter so that you will not undertake any communication or action that will undermine your own goals. Radically accept who and how your daughter is right now. Let go of any illusions, notions, hopes or dreams about effecting change in her. Freeing yourself from any ideas or beliefs that you are somehow responsible for your daughter’s choices or her actions will give you the perspective that you need to be clearly focused on achieving your goals. With these or any other goals you might identify validate your daughter’s concerns as a means of keeping the peace as best you can so that you can see your grandson. Offer support to your daughter without questioning her and having identified your own emotional needs and boundaries have a pre-planned exit-strategy for any breakdown in communication or escalating behavior on your daughter’s part that can be exercised in a way that you make about you and not about your daughter. So if a visit or conversation begins to escalate and your daughter becomes reactive and either acts in or acts out, you can extricate yourself from the interaction in a way that is you making a statement about yourself as opposed to confronting your daughter about anything she is saying or doing. 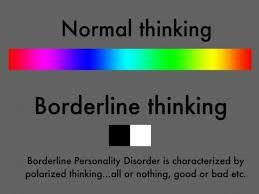 When someone with Borderline Personality Disorder is actively engaging in the defense mechanism of splitting, acting in on one extreme and acting out on the other, the loved one is put in a very painful no-win situation. It will be beneficial for you to open to radically accepting that, with your BPD daughter, you are more often than not put in that no-win situation by her actions, words, and behavior as they manifest from one extreme to another while you firmly understand that the change that one hopes can be sought in this situation and situations like it in so many ways, that must come for the person with BPD him or herself, will one day be sought after by your daughter. In the meantime the no-win situation she holds you in is one that you cannot change. But, you can change how you react to it and how you choose to cope more effectively with it. © The BPD Coach A.J. Mahari and Touchstone Life Coaching September 17, 2009 – All rights reserved.